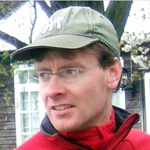 The two teachers’ packs on this website are a free resource for teaching a World History Study of either Ancient Sumer or the Assyrian Empire to children at Key Stage 2. They are intended for year 6 but can be adapted for years 4 and 5. Their creator, Simon Clemenson, is a class-room teacher at Elmgrove School in Harrow who has studied the Sumerian and Akkadian languages and cuneiform script at Birkbeck College in the University of London. Both teachers’ packs contain background notes, bibliography, suggestions for cross-curricular links, web links, and five prepared lessons with SMART notebook (SNB) files and photocopy-able worksheets. 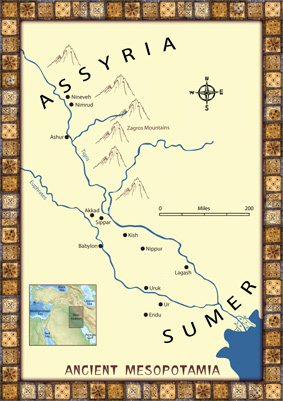 There is also a poster map of Ancient Mesopotamia (illustrated below) showing the locations of Sumer and Assyria. ● The materials in these teachers’ packs have been designed to run on Windows computers and might not run on Apple computers. ● Each lesson can be downloaded as a single ZIP folder containing several files. With recent versions of Windows, ZIP files can be opened and the contents extracted using Windows Explorer. Older versions of Windows may require ZipGenius in order to extract files; click here to download a free copy of ZipGenius. Other free applications to unzip files are available. ● The number and type of files varies from lesson to lesson. Before downloading the lessons, please click here to view/download a printable overview of the Ancient Sumer teachers’ pack. Before downloading the lessons, please click here to view/download a printable overview of the Assyrian Empire teachers’ pack.